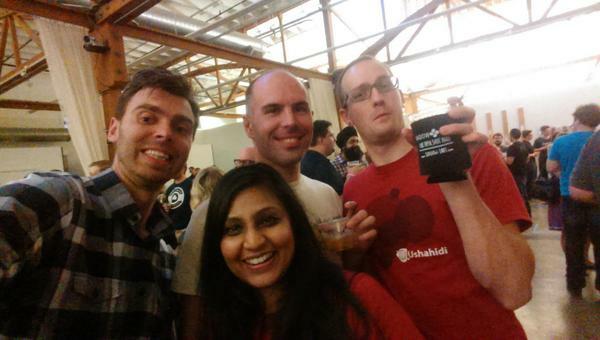 A few of us Ushahidians spent this past week at OSCON 2014 (Open Source Conference) in beautiful sunny (well, almost) Portland, OR and here is our report back to you on the festival of all things open source. TL;DR We went to fascinating sessions, we drank Portland beer, we made new friends, and we got to share our work at Ushahidi with group of very inspired, super high-tech hot shots. The week started off with a bang as two different Ushahidi initiatives got a chance to take center stage at the opening night Ignite session. We were amongst other fascinating speakers and we pretty stoked with the very warm audience response to Woody Gilk's (Senior Developer, Ushahidi Platform) talk on the "Secret Technology that Powers Massive Social Movements" ....and Jonathon Morgan's (Senior Developer, Crisis.NET) talk "Watching Guys Fire Rockets". (Psst. If you are interested in contributing to either of these projects, send us a note!) 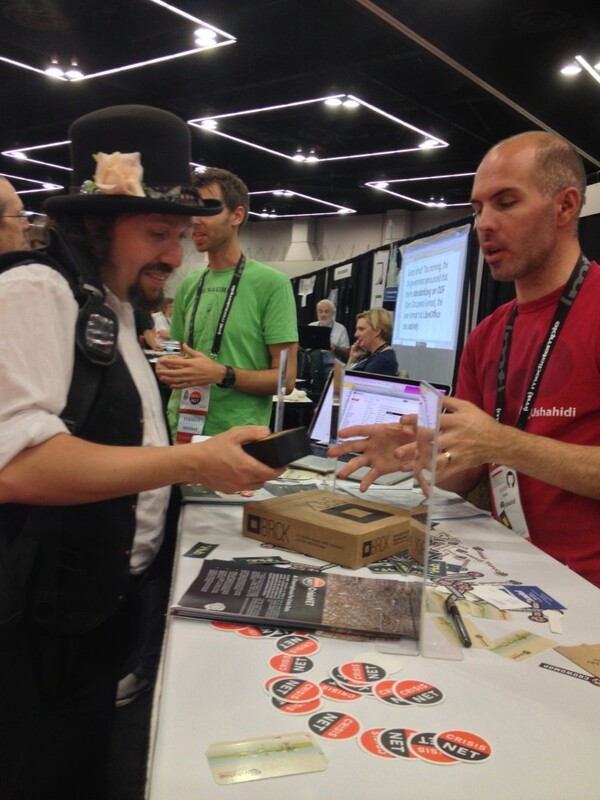 Our OSCON booth was a blast, we got to hang out with our neighbors Wikimedia along with a whole slew of inspiring non-profits in the open source space. We indulged in a few celebrity moments when people recognized the BRCK we brought along to demo and had a blast showing off Ushahidi's new venture into the hardware space. 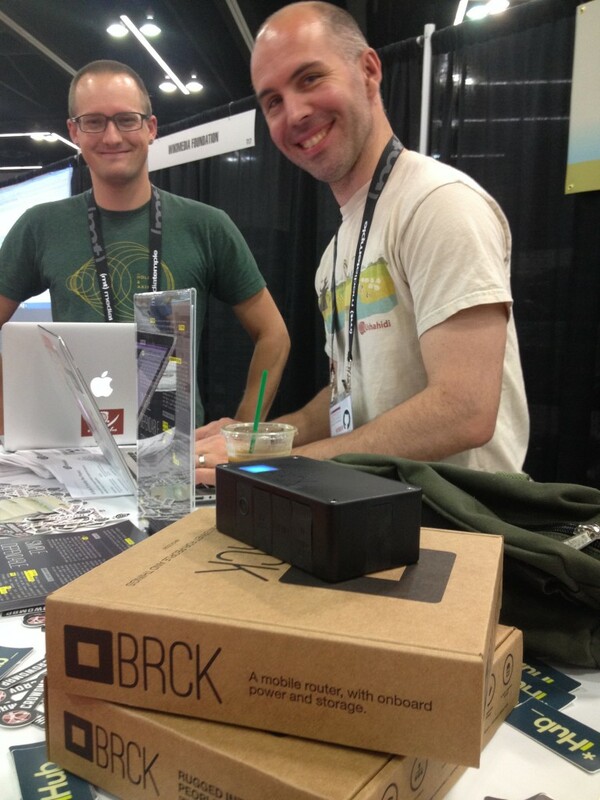 BRCK is a rugged backup generator for the internet and its dashing good looks attracted quite a crowd of curious folks. The best part of the week was the chance to get out from behind our screens and meet people IRL! We got to chat and hang with real people who were: new to Ushahidi, who were exploring new tech for global good, who inspired us with their insights on stage, and of course we loved getting to hang with people we work with everyday, but never see in person. OSCON was also an excuse to meet each other in person - spend some quality time laughing over drinks and co-working along-side one another. We love the ethos of the OS community: strong tenets of good will towards one another, of paying it forward, working collaboratively, doing good, and sharing insights with everyone. And we love to bring this ethos together with our mission of providing tools and opportunities that empower people to improve lives, give voices to the unheard, and help people start massive social movements. The underlying tenets of os lend themselves naturally to global good and it was obvious from our time at OSCON that the OS community at large is thirsting for more opportunities to make a real impact. And with that, we leave you with Paul Fenwick's moving keynote on Open Source for social good. Onward!